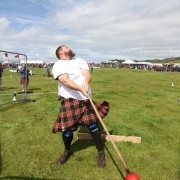 Many consider the heavy events to be what Highland Games are all about, and it is certainly true that the heavy competitions are an integral part of the event and one — the cabar toss — has come to almost symbolise the Highland games. At Arisaig, we have Heavy competitions for Open & Local athletes and as in previous years our Open competition is sponsored by the Road-to-the-Isles Marketing Group. The events start at around 12:30pm and competitors for this category are asked to present themselves to the stewards in the arena in order to register for the competitions. 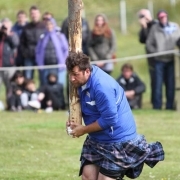 Cabers vary greatly in length, weight, taper, and balance, all of which affect the degree of difficulty in making a successful toss. Not only is strength essential, but considerable skill is also required. Competitors are judged on how closely their throws approximate the ideal 12 o’clock position on an imaginary clock, and it must fall away from the thrower. A 16lb or 22lb stone is propelled from behind a wooden trig. 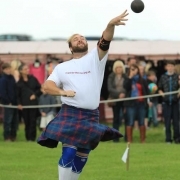 The thrower is allowed to use any throwing style, so long as the stone is put with one hand with the stone resting cradled in the neck until the moment of release. The weight is a 56lb block which has a ring handle attached with the objective to throw it up and over a bar similar to that used in a pole vault. The hammer features a round metal ball weighing 16lb attached to the end of a solid shaft. With the feet in a fixed position, the hammer is whirled around the competitors head and thrown for distance over the shoulder. The event involves a 28lb metal weight at the end of a chain. The implement is thrown using one hand only, but otherwise using any technique. Usually a spinning technique is employed. For most of the heavy events, there is a bonus prize payable to any athlete who breaks the existing Arisaig Games record.